WTI crude oil remains shy of $55 on early Tuesday after surging to fresh 2019 high of $55.55 during Monday on concerns in regards to OPEC+ supply cuts and Venezuelan sanctions. However, the price failed to remain strong during the US session as decline in US factory orders and stronger USD challenged the buyers. While OPEC-led supply cuts and Venezuelan sanctions are playing their role to limit the crude’s downside, challenges to global demand, rising inventory and a stronger greenback confines the commodity’s advances. Today's weekly API inventory data will be a huge concern for the traders. Crude oil prices pushed above the $55 level again printing new highs but this time quickly reversed to end the day in red. 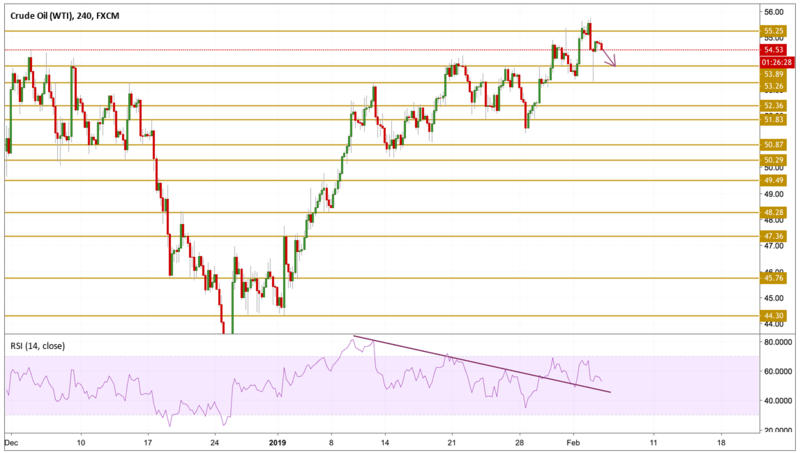 The black gold lost momentum after the RSI signaled a diversion between the price and momentum, therefore, the price moved down reaching the 53.25 level and then settled above the $54 handle. We expect to see the bears retest their strength so we will be focusing on the $53.89 support level.